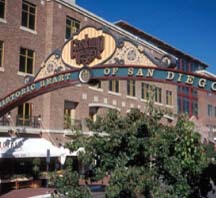 In the historic Gaslamp Quarter, consisting of 16½-blocks around Fourth and Fifth Avenues, grand Victorian-era buildings are home to more than 100 of the city's finest restaurants, 35 pubs and nightclubs and 100 retails shops, as well as theaters, art galleries, offices and residential/work lofts. When the sun sets, this downtown neighborhood attracts thousands of diners, shoppers, theatergoers, and nightclub patrons. The Gaslamp Quarter is where San Diego's colorful past comes alive and exists hand in hand with modern development and commerce in an active urban setting. The Gaslamp Quarter is located in the heart of Downtown San Diego. It's eight blocks long (from Broadway to Harbor Drive) and two blocks wide (from Fourth to Sixth Avenues). There is parking in nearby parking lots and garages. Metered spots are Free on Sunday.